Wow–has it really been over a month since I last posted?! The ironic thing is that I think I’ve been posting less because I’ve been cooking more. I’ve spent most of this morning trying to fix some way too spicy chili that I made last night. I was trying a new recipe, and I didn’t read it as carefully as I should. Instead of putting in two chipotle peppers in adobo sauce, I put in two cans of chipotle peppers. So I probably put in four times as much chipotle as needed. Holy hotness! As I was slicing up the many peppers, I did think, “This is really a lot of chipotle,” but I figured that if that’s what the recipe called for, then it must be right. Argh–one of my food resolutions for this year is trying to build my cooking intuition. I ignored it this time and paid the price. Or rather my husband did because he’s a big chili fan, and I made the chili especially for him. The chili was so spicy, it was practically inedible. I am loathe to waste any food so I wondered how I could tone it down and salvage it. I added another can of beans, some canned core, more crushed tomatoes and a little bit of water. The helped a lot, but it was still super spicy. 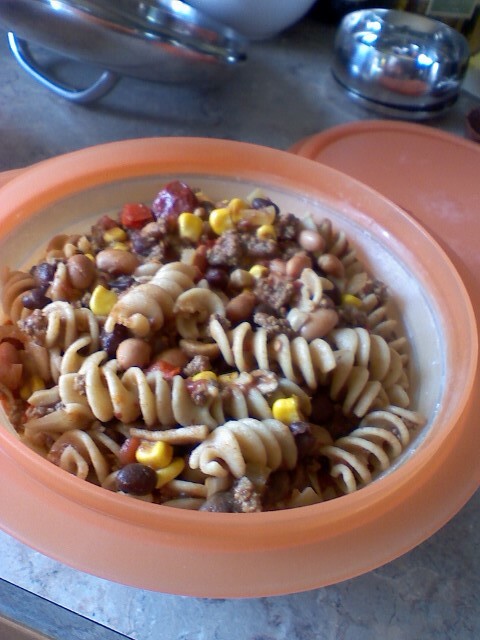 Then I thought, “How about some starch.” So I cooked some rotelle pasta and added it to the chili. That did the trick. The chili was still quite hot, but you actually detect some flavor beneath the spice. And with some cheddar cheese and sour cream, it may even be delicious. The only problem is that adding all of those extra ingredients tripled the volume of the chili so now I’ve got a lot of leftovers to freeze. I better stock up on the Rolaids.